MUSIC FROM THE HEART may also be ordered from your local record store! "If you want people to feel, then let them hear a melody that brings out feelings. You can't deny it, it's the power of music -- and beyond words. With piano, you have a big arena for harmony, counterpoint, technique and making sounds strictly for impression. That is the heart of this music." Read more about the album here! Edtor's Pick at CD Baby! Got Spotify? 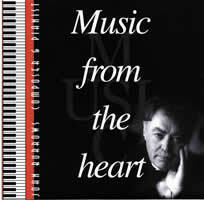 Listen to 'Music from the heart'' here! Got Spotify? 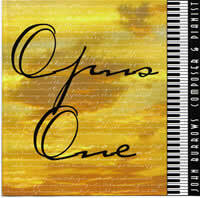 Listen to 'Opus One' here! Available in Berkeley at Amoeba Music —Opus One is upstairs in Classical and Music From the Heart is on the main floor in Easy Listening; and Rasputin Music — both albums downstairs in their Classical Department/Modern Composers.